Fifth N' Sixth's Closet: Closet envy! need that second and third one, please! wauuuuw. I need Christina her shoe collection! amazing post.. I really envy them ;p! Oh my gosh, my ultimate dream is to have a giant walk-in closet! I would never leave my closet ever if i had one as beautiful as these !!! Wow those are dream closets! 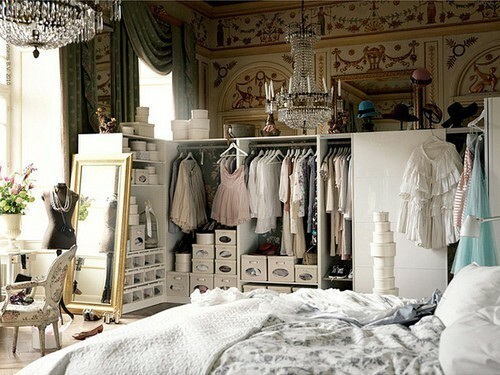 I would love to have such a closet, but of course not without the apropriate shoe collection to display :) Great post! Life is sooo not fair to me lol...Im dieing slowly right now. wow! some of those closets look like a boutique! I love the Kardashian's closet, so much CL shoes!!!! I want them all even though I am quite sure I wouldn't manage walking in them haha. Thank you so much for stopping by and leaving lovely comment on my blog!! Would love to follow you.. infact following you now.. hope you'll follow me too..
you blog is so wonderfuuuul! The 4th picture and Mariah's closet are the best in my opinion! Wow. Clearly I'm still a toddler, just in training, for a closet like these! OMFG, I WANT THE ONE FROM THE FORTH PICTURE AND THE WHITE ONE THAT LOOKS ALMOST LIKE A STORE!! !TRULY ENJOYED THIS!!! !EVERY BLOGGER'S DREAM I THINK!!! WOW ~ these are incredible!! I can't even imagine owning that many clothes and shoes (well, I guess I can haha), but it must be amazing! I definitely would like to have shelves for my shoes someday, even if my closet isn't extraordinary like these. How do they remember which kind of shoes they own, lol! Wow, soooo amazing! And there is so many shoes, it's crazy! Que armarios más bonitos sobre todo el de la segunda foto. Oh my gaaaaddd!!! So jealz, looks insane! i do not believe what i see!!!!omg!!!! these are real Kingdoms;-) loveeeeee them!!! This is exactly what I'm looking for....shelves for my shoes. How fab are these closets!!! i want all of these!! though i don't know i could ever pick something if i had so many options! I really want it all! ahahhahaha! I love those white pants. And those are some crazy and awesome closets. Aaaaamazing! Ah, I always love closet posts. I saw a picture of a two story closet the other day, unbelievable.